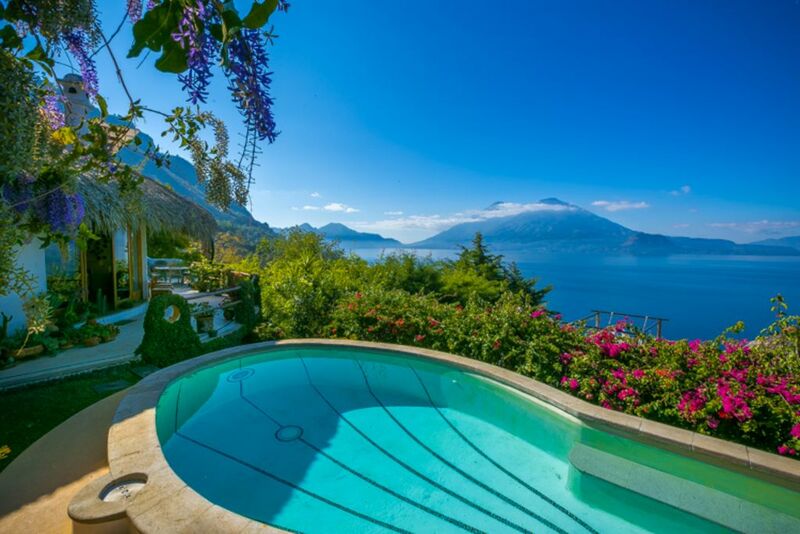 Casa Tzampoc is nestled on a hill overlooking the 3 volcanos that created Lake Atitlan. It is situated between the Mayan villages of Santa Catarina Palopo and San Antonio Palopo and next to two of the most prestigious boutique hotels on the lake. Restaurants and fabulous shopping for local crafts are located minutes away in authentic Mayan villages and the larger town of Panajachel. The house is furnished exclusively with antique and hand made furniture, local textiles, ceramics and crafts. The kitchen is fully equipped for a gourmet cook, which can be arranged. The interior space is separated by an atrium and stairs to private bedroom and bathroom areas. There are views of the volcanos and outside areas from every room through beautiful mahogany windows and doors. The private swimming pool, nestled in the garden, is heated by solar panels and maintained every day by Nicholas, our houseman. The house is beautifully kept every morning by Suli, our maid. All transportation and excursions can be arranged with advance notice. Located just outside the Mayan Kachiquel village of Santa Catarina Palopo and 10 minutes by car or tuk-tuk from Panajachel. What a magical place! We enjoyed our stay greatly. The views were unreal. We were also intimidated by the driveway but what a rush once you reach the top! Having Gustavo guide us helped us feel confident. The kids didn’t want to leave! Thank you so much for your review Marly. Nanette and I are so happy your stay at Casa Tzampoc was all you expected. We always get such wonderful letters telling how much they love going up and down the hill, we have always found it very exciting. We will be happy to welcome you and yours again in the future. WOW.....one word (Breathtaking)!!! That's how beautiful the house is and my family that lives in Guatemala, never had a more wonderful experience in their own country then the one we had. So thanks to Gabriel, Nicolas and Teresa who were very helpful in making our stay even pleasant. Thank you all and we will be back!!! My wife Nanette and I own Casa Tzampoc and depend on Gabe, Teresa and Nicholas to make our guests feel welcome and comfortable. After getting this review we spoke with Gabe who told me that this family was wonderful and embraced their stay. Again Thank you and we will look forward to your return. Great view and location. Nicolas and Teresa were fantastic help. And the cooks Manuela and her husband were amazing. The dinner they cooked was delicious. Should advise renters about the steep and scary drive up to the house. Doesn’t make it easy to go out to town at night. Pool not hot at all so that shouldn’t be advertised as such. Should pay more attention to the toilet paper and water consumption. We ran out of both and had to call Nicolas. Kitchen was quite dirty, had bottles with liquids inside which were unidentifiable. We brought our pet and it had lots of fun too, since the garden and outside sitting areas are very comfortable and spacious. The fireplace was great, we used it both nights. The house was absolutely beautiful and well maintained! The view was spectacular! Everyone that helped and greeted us while we stayed at the house made us feel, both, comfortable and relaxed while we were there. Please let Gabriel know how grateful we are for his help in guiding us to the house, getting up the driveway, helping us bring the luggage in, and for giving us a tour of the residence. Also, Thank you Nocholas for helping us unload our luggage, the fantastic conversations, and willingness to go above and beyond to ensure that our stay was perfect. Again, thank you all for such a phenomenal experience en La Casa! Who told us Patty and family were terrific guests. We always love to have groups like this who are respectful to the house and our wonderful workers, we would welcome them back if they choose to come back to the Lake. Hermoso lugar, acogedor y tranquilo. La atencion fue excelente. We stayed in Santa Catarina Palopo for 3 nights - 6 adults. The house is beautiful and very comfortable. We enjoyed the views, the pool, and the great decoration details of the house. The people attending the house, mainly Nicolas, and the cooks, Teresa and Angela, were extremely courteous and we were thrilled at there professionalism and kind attention to us. Angela prepared some of the best dinners we had during our Guatemala trip. My son and his wife rates the place 5 Stars. I am generally a bit fastidious so I give it 4 stars because of a few things: 1) The description of the rental did not indicate specifically that the house has no access to the Lake (my daughter-in-law and I did not see one); 2) The linens in the main bedroom were not particularly spotless, in fact when I pulled the sheet there was blood stain on the mattress cover, which did not look that was washed as it was bright red. 3) This one is something that the property owners have no control yet it will be important for people that like to sleep. There are some dogs in the neighborhood that bark all night consistently every night. Still, it is a lovely property, the housekeeper and cooks are beautiful lovey people and it was a pleasure meeting them. I would stay here again. Adriana thank you for your review and we are happy that you enjoyed your stay. Our excellent help were very pleased too and mentioned that you were a very nice group. As for your complaints, it is too bad that you didn't call David or Gabe who is the consierge for the house they would have provided you with access to the lake. It is a 10 minute walk through the village or there are dedicated places where people go swimming. The problem with stains on the bed would have been taken care of ASAP if it was called to Teresa's attention. She has cleaned and corrected it. Unfortunately there are many dogs in homes and on the street and sometimes something just sets them off. We want to thank Adriana for her thoughtful review and for letting us know about things that were not quite right, without Adriana letting us know, these things do not get fixed.